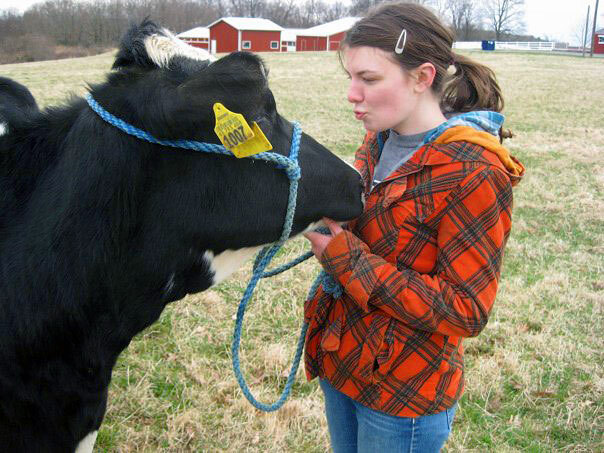 When choosing to attend the University of Connecticut for my undergraduate degree, its background as an agricultural school appealed to me. I had been a major “horse girl” in my pre-teen and teenage years (a passion that mostly manifested itself in a plastic model collection), and I loved that I would have the opportunity to visit with the farm animals whenever the desire arose. Plus, I was a suburbanite with intentions to move to New York City after graduation. I didn’t know when I would have another chance to live so close to chickens, pigs, and horses. One day, in my sophomore year, one of the generic university-wide emails in my inbox caught my eye. 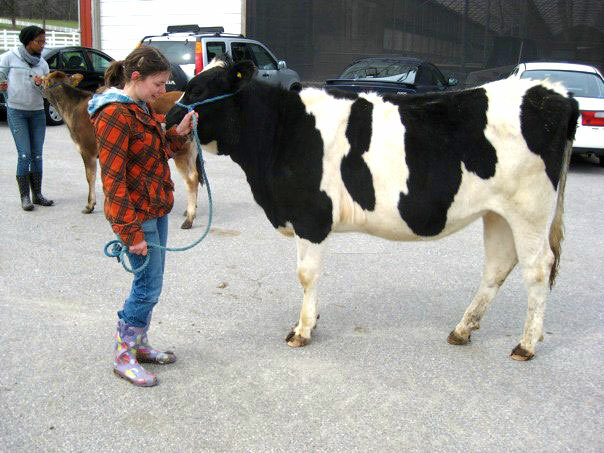 The UConn Dairy Club was inviting the student population to train a cow for its upcoming Dairy Show. My first thought: Count me in! The participants chose our heifers in a classroom in an old agricultural building at the far corner of campus. As an art major with no experience in the cow barns, the chalkboard full of names meant nothing to me. I drew a slip with “#3” scrawled on it, meaning I was one of the first of many to choose. I went for my favorite name: Peaches. The name evoked a delicious dessert with whipped cream and a sweet baby calf that was so excited to have a new pal. How could I go wrong? Not exactly a sweet baby calf. When they called my number and I stated my choice, I’ll never forget the expression on the Dairy Club President’s face. It was a stern scowl that seemed to blare: “Good luck with HER!” True, it’s highly possible that I exaggerated this memory in my excitement and anxiety — but that was all I had to go on at the time. What did I just do? I met Peaches on a sunny afternoon. It turns out that she wasn’t the wee baby I had fantasized about: she was BIG. 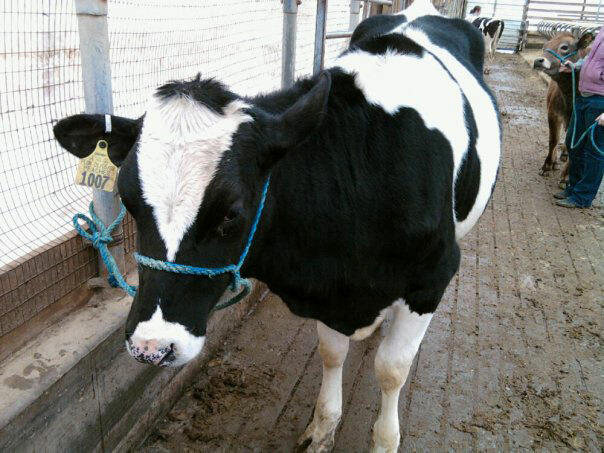 Although not full-grown, she was one of the oldest heifers in the barn. 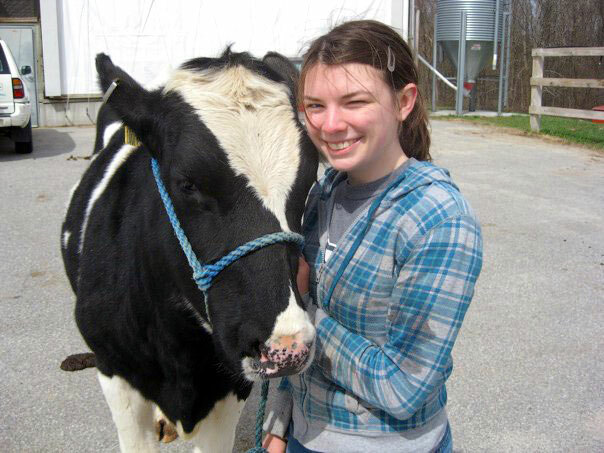 One of the Dairy Club members led me to the pen full of her peers, haltered her, and warned, “Just be careful when you get her from the pen – sometimes these girls have attitude. Don’t be afraid to assert yourself.” I stood there in my cupcake-patterned rain boots and trendy plaid jacket, wondering again what exactly I had gotten myself into. The first day I met Peaches. Clearly, she was thrilled. Turns out, in addition to the unexpected size, Peaches wasn’t exactly sweet. 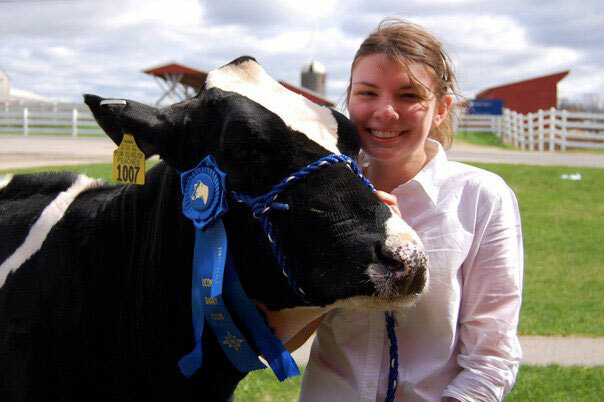 Although I had heard rumors that she had done well at the Fall Semester Dairy Show with an agriculture major at her side, she definitely had a little bit of a reputation. We spent the first few weeks walking — well, attempting to walk — the length of the barn and back. We did have better luck than some of the participants with the youngest calfs, who had never seen halters and would firmly plant their feet. It gave me hope. Still, it was clear the Peaches still had a mind of her own. Of course, I matched and surpassed her attitude: frustrated with her unwillingness to be best friends, I would groan and pout. I would snap at her. I would pull on the lead rope, hoping to tug her into cooperation. I was fed up. She was fed up. We were fed up together. Why had I chosen to do this, again? One day, I checked my dorm mailbox and found a letter from my grandma. It contained a clipped article about a farmer who decided to start singing to his cows – and the cows started to produce more milk. Cute, sure, but I wasn’t going to be milking Peaches. I tossed it on my desk and went off to the barn. The next day, after a particularly frustrating battle of wills, I remembered the article. 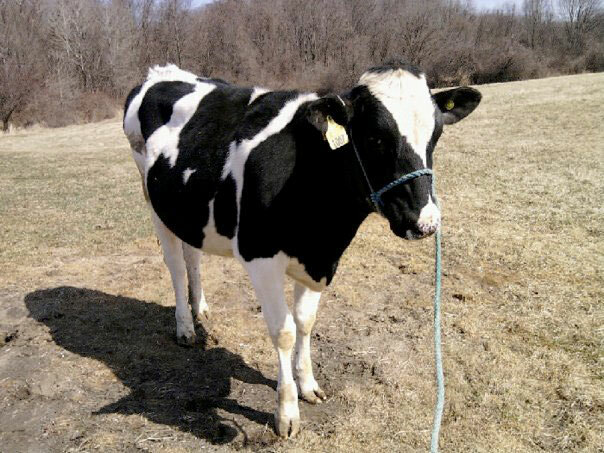 I stopped pulling on the halter, took a deep breath, and started crooning. “Hey, girl, I know you can do this.” She took a step, and the rest was history. Peaches and I became pals. I started to enjoy our time together, letting her gleefully run around in the grass each day before getting down to work. The spring days grew warmer, and so did our relationship. Instead of grumbling when I was frustrated, I spoke as sweetly as I could, patted her, and gently encouraged her. We developed a working relationship, and I didn’t seem to be the only one enjoying our training sessions. At the Dairy Show, we won first place in our Novice A class. I couldn’t believe it. When the judge lined us up in our final order before announcing the winners, I assumed our spot at the tail end meant that we placed dead last. Turns out I was wrong. 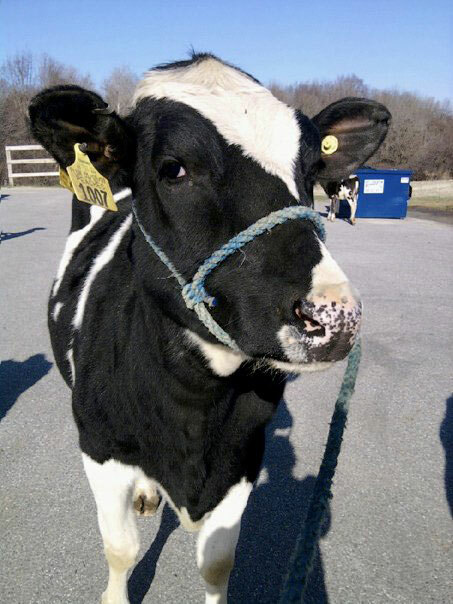 After our class, my friends and I showered my winning bovine with love and praise. When I turned Peaches back into her pen for the last time, she actually paused for a pat before returning to her girls. While it wasn’t enthusiastic mooing at the sight of me entering the barn, I took it for what it was: the true prize. Training an anxious, reactive dog is hard. It requires patience, timing, and – most of all – positivity. 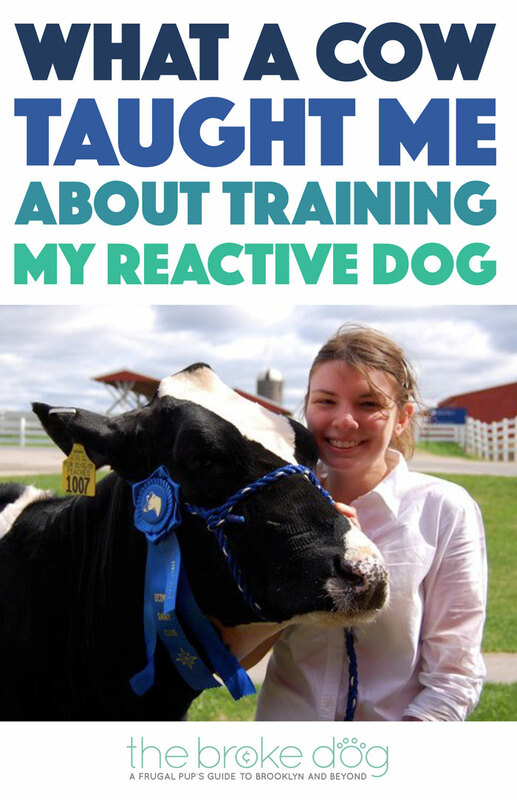 Reactive dogs are anxious and fearful. It does not help Henry if I scream and shout each time he barks at a noise in the hallway or a dog on our walks. He needs support, not antagonism. When I get the urge to explode, I remember Peaches: I take a deep breath, compose myself, and calmly and sweetly carry on. This tactic has helped Henry’s training immensely. He feels supported and gains confidence. I can’t help but melt each time I see him relax and wag his tail. 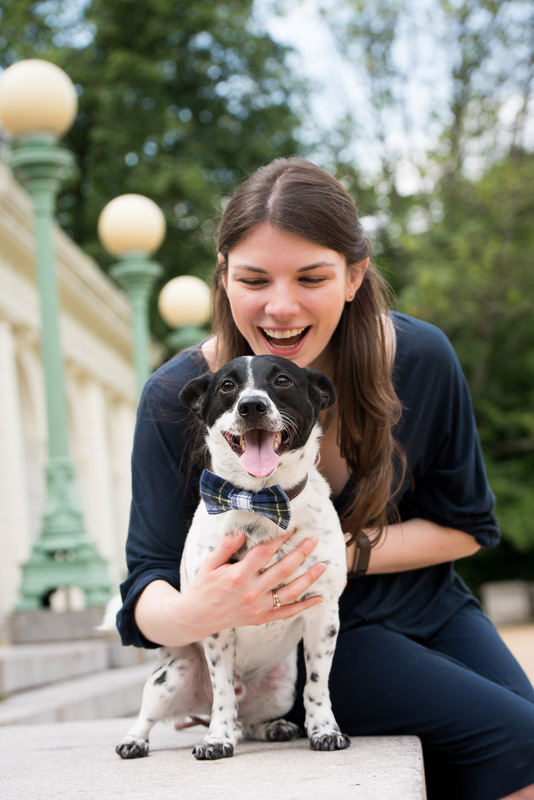 Because of his black spots, some of my friends call Henry “Baby Cow.” They don’t realize how perfect that nickname really is! OH MY GOSH! This was such an entertaining post!! I didn’t know that people trained cows, I knew a girl who raised a cow to show but it was more about meat than training as far as I knew. I like that through your grandmother doing, can we say a very grandmotherly thing, you learned a life lesson that helps in many different aspects of life! P.S. 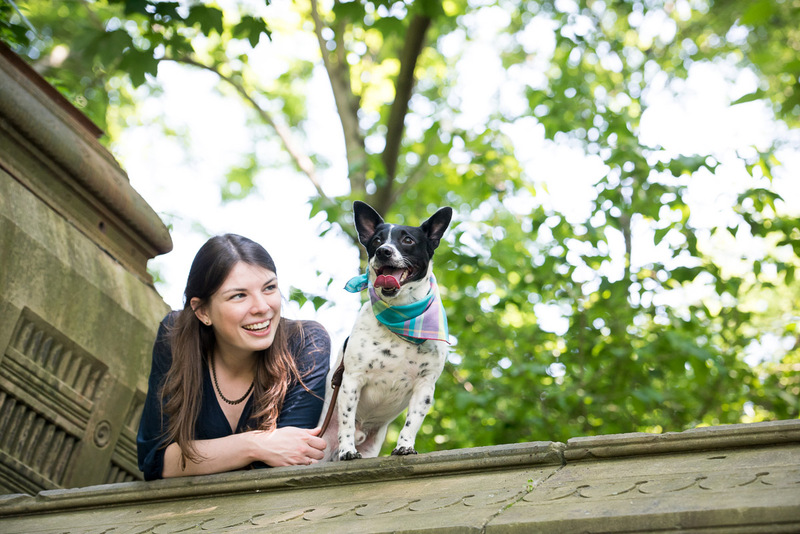 I love these adorable pictures of you and Henry and Peaches! Thank you! I’m glad you enjoyed it 🙂 It was definitely a grandmotherly thing!